Some notes on political pirate radio stations in Dublin. Radio equipment and arms seized by Gardaí in Dublin. The Irish Times, 17 April 1958. Ireland has a long history of pirate radio, something I’ve looked at before in an article for Rabble that can be read here. This brief article looks at a number of political pirate radio stations that operated in Dublin, many of which were operated by the republican movement as a means of spreading propaganda. So many wonderful things happened to us in the “Milinda Days”. We met so many wonderful people. One who comes to mind straight away was James McGuinness who lived across from us in the Diamond. He had the most wonderful collection of records and I remember doing a four hour special on the life on Glen Miller thanks to his record collection. At the weekend the house was full of people who just wanted to sit around, listen and chat. Pirate radio was often utilised in the North during the conflict there, in particular by republicans. Among the most celebrated examples of this is Radio Free Derry, which broadcast during the Battle of the Bogside in 1969. In the south, pirate radio often offered a means of countering the Section 31 legislation, which was designed to keep republican voices off the airwaves and off television screens. In 1987 for example Gerry Adams conducted a 75 minute interview with a pirate radio station in Limerick, something that was condemned by the authorities as a breach of the legislation. Even before that legislation however republicans were utilising pirate radio across the Republic. In 1936 a reference was made in several newspapers to “the mysterious pirate radio station in the Free State”, with the Leitrim Observer noting that “Many listeners in the Free State heard the stations unknown announcer deliver a speech in which there was a denunciation of recent Government decisions. The speaker said the station had been acquired for the purposes of the Irish Republican Army.” In late 1939 a republican named Sean McNeela was sentenced to two years imprisonment for his involvement with an IRA pirate radio station which was broadcasting from Rathmines, and raided by state authorities while on air. 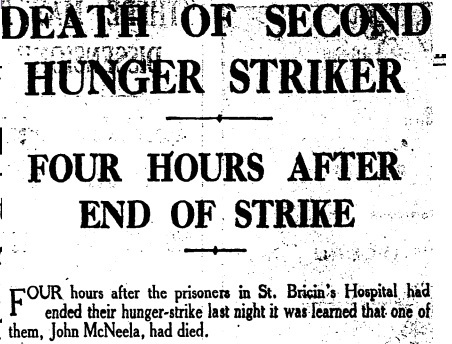 Sentenced for “conspiracy to usurp a function of Government”, he died on hunger strike, along with Tony Darcy, in 1940. The death of McNeela is reported in the press, 20 April 1940. 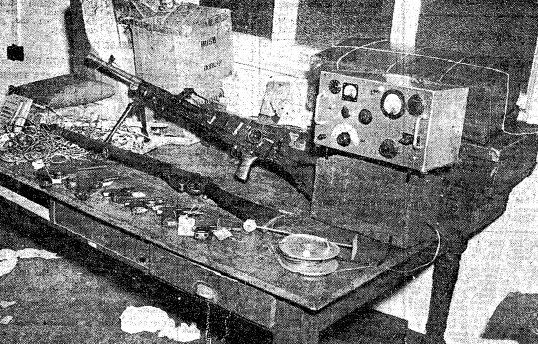 In April 1958, there was a high-profile raid by Gardaí in Harcourt Terrace against a republican pirate station, which led to a front-page image for The Irish Times reproduced at the start of this piece, showing radio equipment alongside numerous small arms weapons and military equipment Gardaí alleged were seized at the location. It is believed that the organisation which operated the pirate radio station has at least one other transmitter set in Northern Ireland. The station came on the air, usually at 11.30pm, and called itself the ‘Irish Freedom Radio’. At Easter it also broadcast in the afternoon. On some occasions, before it went on the air, anonymous telephone callers informed newspaper offices of the broadcasts. There was drama on Capel Street during the 1981 hungerstrikes, when members of Na Fianna Éireann, the republican youth movement, seized the equipment of the recently closed ‘Radio City’ to make political broadcasts. The rebel song ‘Rifles Of The IRA’ was played on air, followed by an appeal to listeners to support Bobby Sands and the other H Block men. When Gardaí arrived on scene, the young men emerged from the building and marched with supporters to O’Connell Street. Political pirate radio was not restricted to Dublin, or indeed to republicans. ‘Radio Pirate Woman’ for example broadcast from Galway in 1990, and broadcast “information on abortion services” as well as discussing other issues that affected women. The promoter of the station, Ms. Margaretta D’Arcy, insisted she was “unconcerned about the possibility of prosecution” for the station. She also told the media that the transmitter for the station cost just £10, and that all the labour involved was carried out on a voluntary basis. At the time of writing this post Margaretta is in prison for her activities as a peace activist. Some woman the d’Arcy one.